Liposuction is a minimally invasive body contouring procedure that surgically breaks up and permanently removes fat cells. Liposuction is the mechanical removal of fat cells using a thin stainless steel tube inserted through a small incision. Incisions are strategically placed to permit access to the areas treated. Liposuction once required general anesthesia, but can now be performed using only local anesthesia, making it a much safer procedure. This “tumescent liposuction” technique, invented by dermatologists is clinically proven to have the better safety profile than traditional liposuction. 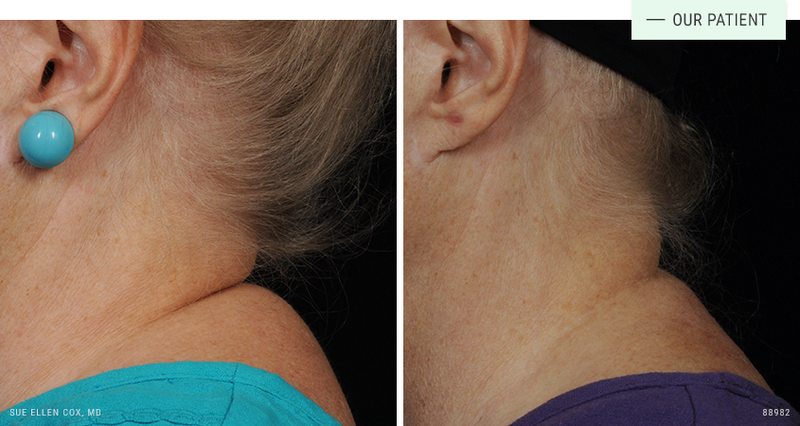 Before | After: This patient received liposuction treatment to her upper and lower abdomen. Before | After: Liposuction is effective for larger areas like the abdomen, as well as smaller areas like the back of the neck. The FDA has cleared tumescent liposuction to safely treat unwanted fat. It has an excellent safety profile. Like any medical procedure, there are risks. As someone who authored a chapter in the textbook “Safe Liposuction” and has lectured extensively in the US and Europe on tumescent liposuction, Dr. Cox stresses the importance of finding an experienced physician who understands the finer points of fat reduction. Liposuction is well tolerated. Because liposuction is a more intensive surgical procedure, a preoperative visit is required to provide detailed information about the procedure and recovery process. In our office, the procedure is conducted using local anesthesia. This means that you will be awake but relaxed during the procedure, and should not experience pain. Comfort measures are developed for each patient based on the treatment plan. Depending on the area, the entire visit typically lasts two to three hours. You will need a driver to take you home. Liposcution requires downtime. Patients can usually depart our office about 30 minutes after completion of surgery. Swelling, bruising, draining and soreness are typical during the first few days. Medication may be used to minimize discomfort. It is important to wear a compression garment for one week to minimize swelling and bruising. It is possible to return to physical activity after a week. Liposuction can produce more dramatic results than non-invasive procedures. Dr. Cox will work with you to discuss your goals and the range of outcomes you can expect. Liposuction can be used to treat most areas with excess fat, including under the chin, arms, “bra fat,” back, abdomen, flanks, inner and outer thighs and knees. Most patients are happy with results from one treatment.